NORTH PLAINS, Ore. â€” When Kimberly Kim fell behind after the first 18 holes of the 106th U.S. Women’s Amateur, her caddie suggested she play “smashmouth” golf. The 14-year-old player from Hilo took the advice and beat former bank clerk Katharina Schallenberg of Germany, 1 up, in 36 holes of match play yesterday to become the event’s youngest champion. Schallenberg, 26, made a birdie putt from off the green on the par-5 36th hole. That placed the pressure on Kim to birdie for the victory at Pumpkin Ridge Golf Club. She sunk the putt from 5 feet out. 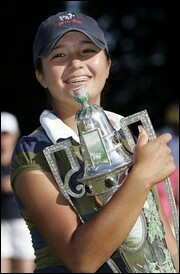 Kim became the second Hawai’i player to win a United States Golf Association event this summer. Kaua’i's Casey Watabu won the U.S. Amateur Public Links Championship last month. She joins Hawai’i legend Jackie Pung, who won the U.S. Women’s Amateur in 1952. Grace Park, who spent some of her early years in Hawai’i, won in 1998 after she moved to Arizona. The championship match, on the 6,380-yard, par-71 Witch Hollow Course, featured very different players: Kim is a carefree teenager who didn’t know going in that the Amateur was a “big” tournament, while Schallenberg is consistent and steady. Kim, who has a mouthful of braces and says her hobby is sleeping, has been living recently in Mesa, Ariz., with her mother to be able to participate in more tournaments. But she still lists Hilo as her hometown. Kim lost in the Women’s Amateur Public Links final to Tiffany Joh, 6 and 5, earlier this year. She was the youngest player to make the cut at the U.S. Women’s Open. Kim didn’t realize the weight of the run she was making at the Amateur until she saw a commercial for the event on television. A former Amateur champion then showed her Cox Cup. Before Kim, the youngest Amateur champion was Laura Baugh, who won it in 1971 at 16 years, two months and 21 days. Congratulations to Kimberly. She turns 15 this week and already has an impressive amateur golf record. Kimberly joins Michelle Wie and Jane Park as young Korean-American golfers who are or have come up through the US amateur ranks. More are coming too. The Korean impact on ladies professional golf will be a homegrown phenomonon too soon. Let me say this. I believe Michelle Wie will be a star on the LPGA tour. She hasn’t won yet, it is just a matter of time. However I think Michelle’s pursuit of playing against the men is misguided. At best she would be a run of the mill PGA pro. I don’t think she’ll ever get that high. With the exception of the one event in South Korea, Michelle hasn’t proven anything against the men. To me it looks like a misguided hollow pursuit. Perhaps driven by commericial reasons(Nike) or poor decision making(BJ Wie, Michelle’s father). It can’t be for publicity purposes, Michelle certainly doesn’t lack that. Michelle needs to prove herself against fellow women professionals. One 16-year-old Korean amateur, Amy Yang, did so by winning the Australian Masters last February. Michelle should focus on the LPGA tour and forget about men’s golf. The ladies tour is where Michelle’s future lies. I also think the future of the LPGA could very well be linked to Wie also. The large fan following and publicity Michelle would bring to the LPGA can only help that troubled tour.